After the artistic success of 1981's Difficult To Cure, Ritchie Blackmore kept Rainbow's line-up largely intact, with the only change on keyboards where David Rosenthal replaced Don Airey. But then Rainbow go ahead and ruin everything by releasing Straight Between The Eyes, three acceptable songs surrounded by no less than six tracks that can only charitably be called filler. On garbage exquisitely titled Tite Squeeze, and asinine tracks Power, MISS Mistreated and Rock Fever, Rainbow go through the motions of the worst type of moronic rock, gratuitous themes repeated in childlike manner, no signs of skill, talent or innovation. It is unclear what target audience could possible exist for this rubbish, and it's sad to think that Blackmore and bassist / producer Roger Glover would go ahead and fill half an album with trash unworthy of their name. Two of the three substantial tracks open the album, Death Alley Driver thriving on an accelerator jammed near the floor. At the 2:05 mark Blackmore lets loose with a stirring one minute solo to prove that the soul is still there when the imagination allows, before giving way to Rosenthal, who enjoys his own moment of keyboard glory. Stone Cold follows with a polished radio-friendly slow-tempo rock ballad, perfectly suited to Turner's voice. After the next six forgettable tracks come and go not soon enough, the record closes on a bit of a high, Eyes Of Fire a throwback to the Ronnie James Dio era of demons and darkness, an eastern theme attempting a bit of a Kashmir vibe but suffering a mild case of one-dimensionalitis. It is nevertheless a masterpiece compared to the material preceding it. 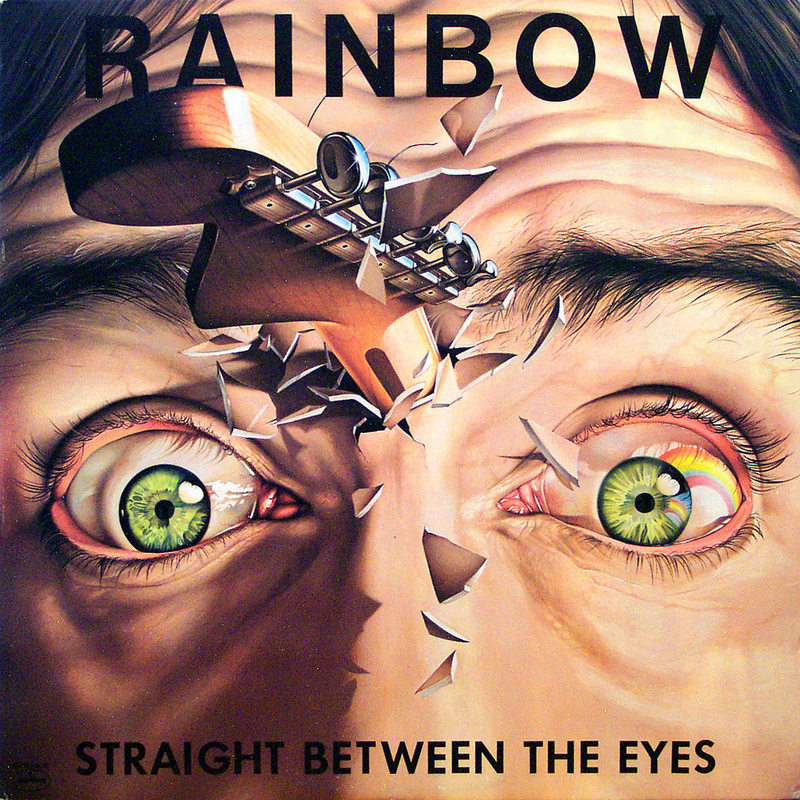 And yes, the horror of how far Rainbow have steered off-course does hurt like a migraine exploding Straight Between The Eyes.